Before designing a project to retire some portion of the technical debt borne by a critical, irreplaceable asset, it’s best to acknowledge that the project design problem is very likely a wicked problem in the sense of Rittel and Webber [Rittel 1973]. (See my post “Retiring technical debt can be a wicked problem”) In the series of posts of which this is the first, I suggest some basic preparations that form a necessary foundation for success in approaching the problem of designing projects to retire technical debt in irreplaceable assets. 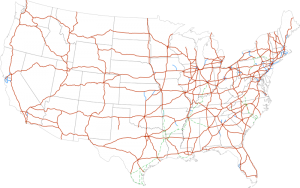 A map of the U.S. Interstate Highway System. 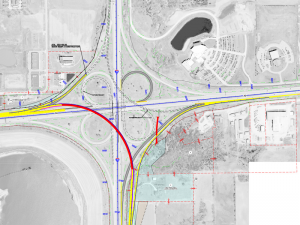 The map shows primary roadways, omitting most of the urban loop and spur roads that are actually part of the system. In 2016, the total length of highways in the system was about 50,000 miles (about 80,000 km). About 25% of all vehicle miles driven in the U.S. are driven on this system. The cost to build it was about USD 500 billion in 2016 currency. Given the advances since the 1950s in technologies such as rail, electronics, data management, and artificial intelligence, and given the effects of petroleum combustion on global climate, one wonders whether such a system would be the right choice if construction were to begin today. If alternatives would be better, then this system might be regarded as technical debt. But replacing it might not be practical. Finding a way to retire the technical debt without replacing the entire asset might be the most viable solution. Image by SPUI courtesy Wikipedia. As I’ve noted in previous posts, the problems associated with retiring technical debt can be wicked problems. And if some of these problems aren’t strictly wicked problems, they can possess many of the attributes of wicked problems in degrees sufficient to challenge the best of us. That’s why approaching a technical debt retirement project as you would any other project is a high-risk way to proceed. TDIQ is the Technical Debt In Question. That is, it’s the kind of technical debt we’re trying to retire from the assets among the DBA. Other instances of the TDIQ might also be found elsewhere, in other assets, but retiring those instances of the TDIQ is beyond the scope of the DRP. For those technical debt retirement projects that exhibit a high degree of wickedness, clearly communicating the mission of the DRP is essential to success. The DRP team will be dealing with many stakeholders who are in the early stages of familiarity with the term technical debt. Some of them might be cooperating reluctantly. Expressing the objectives and benefits of the DRP in a clear and inspiring way will be very helpful. With that in mind, I offer the following reminder of the reasons for tackling such a large and risky project that produces so few results immediately visible to customers. Examining alternatives to retiring the TDIQ is a good place to begin. One alternative is simply letting the TDIQ remain in place. Call this alternative “Do Nothing.” A second alternative to retiring the TDIQ is replacing the debt-bearing asset with something fresh and clean and debt-free. Call this alternative “Replace the Asset.” The problem many organizations face is that they cannot always rely on these alternatives. In some circumstances, the only viable option is debt retirement. And because these two alternatives to debt retirement aren’t always practical, some organizations must develop the expertise and assets necessary to retire widespread technical debt in large, critical, irreplaceable systems. Below is a high-level discussion of these alternatives to debt retirement. The first alternative is to find ways to accept that the DBA will continue to operate in their current condition, bearing the technical debt that they now bear. This alternative might be acceptable for some assets, including those that are relatively static and which need no further enhancement or extension. This category also includes those assets the organization can afford to live without. One disadvantage of the “Do Nothing” approach is that technology moves rapidly. What seems acceptable today might be, in the very near future, old-fashioned, behind the times, or non-compliant with future laws or regulations. Styles, fashions, technologies, laws, regulations, markets, and customer expectations all change rapidly. And even if the asset doesn’t change what it does, the organization might need to enhance it in ways that become very expensive to accomplish due to the technical debt the asset carries. For these reasons, Do Nothing can be a high-risk strategy. The second alternative to retiring the TDIQ is to replace the entire asset. For this option, the question of affordability arises. In some instances this alternative is practical, but for many assets, the organization simply cannot afford to purchase or design and construct replacements. And for those assets that “learn”, and which contain data gathered from experience over a long period of time, retiring the asset can require developing some means of recovering the experience data and migrating it to the replacement asset—a potentially daunting effort in itself. Replacement is especially problematic when the asset is proprietary. If the organization created the asset itself, they might have constructed it over an extended period of time. Replacement with commercial products will require extensive adaptation of those products, or adaptation of organizational processes. Replacement with assets of its own making will likely be costly. Thus, when organizations depend on assets that they must enhance or extend, and which they cannot afford to replace in their entirety, they must develop the expertise and resources needed to address the technical debt that such assets inevitably accumulate. This series of posts explores the issues that arise when an organization undertakes to retire the technical debt that its irreplaceable assets are carrying. Below, I’ll be inserting links to the subsequent posts in this series.